"Over the past year, we have repeatedly taken action against violent actors and bad content on Facebook in Myanmar. The ethnic violence happening in Myanmar is horrific, and we don't want our services to be used to spread hate, incite violence or fuel tension on the ground," Facebook wrote in its Tuesday blog post. Since August, Facebook has taken down 425 pages, 17 groups, 135 accounts and 15 Instagram accounts involved in the incitement of violence against ethnic groups in Myanmar. "Today, we are taking more action, designating four more groups in Myanmar as dangerous organizations — the Arakan Army, the Myanmar National Democratic Alliance Army, Kachin Independence Army and the Ta'ang National Liberation Army," Facebook added in its post. "These armed groups are now banned from Facebook, and all related praise, support and representation will be removed as soon as we become aware of it." The groups are ethnic separatist groups in Myanmar that have battled for autonomy ever since Myanmar won its independence from Britain in 1948. According to Facebook, there is "clear evidence that these organizations have been responsible for attacks against civilians" in Myanmar, and it wants to curb the groups from "using [Facebook's] services to further inflame tensions on the ground." 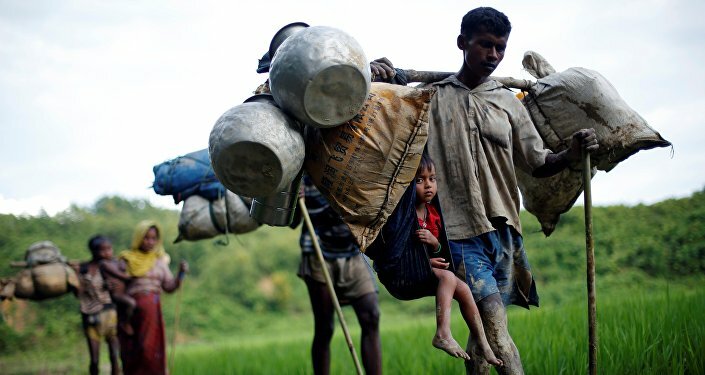 For example, the Arakan Army, which is a Rakhine insurgent group in Myanmar, was responsible for killing 13 policemen and injuring nine others in western Myanmar last month, while the Rohingya people have reported countless atrocities at the hands of the Myanmar National Democratic Alliance Army since the early 1990s. The Rohingya are a Muslim minority group living in mostly-Buddhist Myanmar. Facebook's move comes after a United Nations reporter accused Facebook of spreading "acrimony, dissension and conflict" in escalating what is now being called a genocide against ethnic Rohingya Muslims by Myanmar security forces. According to Chair of the UN Independent International Fact-Finding Mission on Myanmar Marzuki Darusman, the social media giant has played a "determining role" in the documented atrocities still playing out in Myanmar, Sputnik previously reported. Since August 2017, more than 723,000 Rohingya Muslims have fled Myanmar's Rakhine state, seeking shelter in neighboring Bangladesh, the UN Refugee Agency states on its website.